Producers Emmanuel Benbihy and Claudie Ossard are to be congratulated for undertaking such an ambitious project. With a stellar cast that includes Marianne Faithful, Bob Hoskins, Miranda Richardson, Juliette Binoche, Willem Dafoe, Nick Nolte, Maggie Gyllenhaal, Elijah Wood, among many, many more, each segment is markedly unique although the one common theme is that each of these vivid, kaleidoscopic views portrays someone who is either in love in Paris or in love with Paris -- arguably the most romantic city in the world -- Bulverde, Texas notwithstanding. 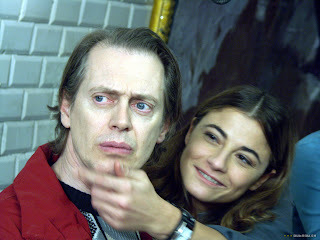 One of the highlights is TUILERIES, co-directed by the Cohen Brothers, starring Steve Buscemi as a typically clueless American tourist who unintentionally captures the attention of a young woman in the bowels of the Paris subway system, much to the chagrin of her paranoid lover. Another highlight for this reviewer was TOUR EIFFEL, a charming, almost giddy tale of mimes in love directed by Sylvain Chomet (two-time Oscar winner for animation). To find myself thoroughly enjoying this particular valentine is a testament to Chomet's talented directing skills as I generally find anything to do with mimes to be as irritating as Topo Gigio or Sean Hannity. Perhaps the most unusual segment is QUARTIER DE LA MADELEINE, a stylish pop-art vampire romp that may seem out of place among the other films, but Hell's bells, vampires need love, too. And the beauty of a short film anthology is that if one of the films doesn't appeal to you personally, it is only a matter of minutes before another totally different story unfolds on the screen. Hey, who doesn't like a "quickie?" Of course, every pu pu platter has that one delicious morsel that trumps all the other offerings, and in my opinion 14TH ARRONDISSEMENT is not only the last segment, it is the most enchanting. 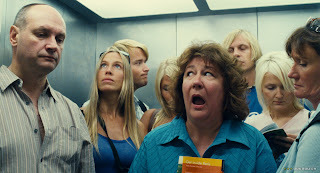 Alexander Payne (SIDEWAYS, ABOUT SCHMIDT) begins his story as a humorous look at an unsophisticated, frumpy, dumpy American tourist, played by Margo Martindale (Ma Cox in WALK HARD: THE DEWEY COX STORY, along with over sixty other credits) which subtly transforms into something totally different, concluding on a poignant, surprising, wistful note. Just like puffing on a Gauloises after a "nooner," this is the perfect way to end this wonderful collection of cinematic quickies. What's Uglier Than A Bob Stoops Hickey?